I’ll bet they don’t live in a light bulb. These certainly do and they seem pretty happy about it. 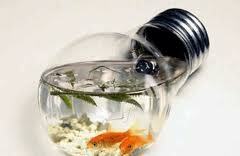 This would be a great idea for Bettas better knows as Siamese Fighting Fish. Bettas do not get along with others very well and unless they are looking for a mate they don’t even like each other. Because these fish get their air by swimming to the top of the water to get little snippets of air, this would be a perfect home for them. As a note, be very careful to wash the inside of the bulb with extreme care as any frosting, glass or other tiny matter left in the bulb could essentially be a death sentence for your fish. I would love to see your mini-aquariums so please send pictures and other ideas. Categories: LIGHT BULB CREATIONS | Tags: aquariums, craft, fish, Light Bulbs, plants, re-purpose | Permalink.